Each child has the ability to learn, regardless of any label. If we can help our children find a passion for learning, then we are helping them reach their fullest potential. With a child on the spectrum, especially a non-verbal one, it can be rather difficult and challenging to help our little ones not only learn, but also enjoy the process. One method that worked for my son involves utilizing magnets. The examples mentioned were a result of suggestions from my son’s previous occupational therapist and inspiration from Pinterest, the virtual bulletin board. To start, I bought picture magnets for the fridge (the ones used for a 4 x 6 picture), and I put weather terms on index cards for each one. One magnet said, “Today’s Weather.” The other magnets included snow, rain, sun, etc. Each day, I would have my son go to the window, and I would discuss the weather. Next, we would go to the fridge, and I would ask him to find the weather for that day. This is a great activity to do prior to a child entering preschool or kindergarten. As a “ramp-up” activity for older children, you could connect the weather with pictures of your child wearing appropriate clothes for that season. This will help your son or daughter with developing independence in the future when it comes to choosing appropriate attire for the day. 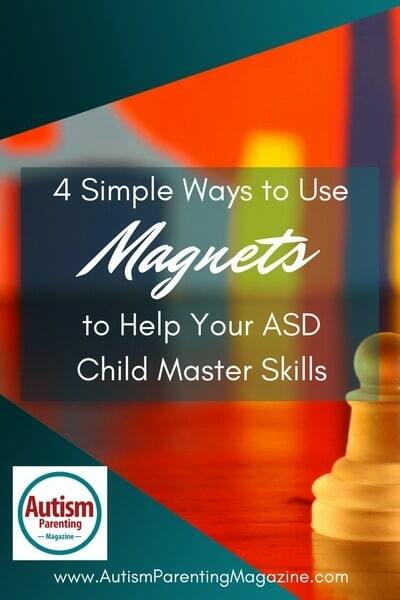 Another method for using magnets is for shape identification. I used plastic worksheet holders for binders (purchased at an office supply store). I bought a roll of magnets from a craft store and I put strips on the back of two plastic sheets. This allowed me to switch the paper out each day, depending on the task. Next, I took a piece of computer paper and made the shapes I wanted him to identify in the four quadrants of the paper. I started with a circle, a square, a rectangle, and a triangle. Once he practiced those, I moved to harder shapes, like crescents and stars. I made the shapes by cutting them out of construction paper and putting tape around them to prevent ripping (If you have a laminating machine, even better). I put a magnet on the back of each one, and I had my activity complete. When doing the activity on the fridge, sometimes I would put different shapes higher than others to encourage reaching; this is beneficial for proprioception or the awareness of one’s body. To further your magnet use, you can switch out the shape sheet, and create animal “environments,” such as a farm, an ocean, or a safari. I made animals for these pictures, and my son practiced sorting animals according to their natural habitat. If your child is verbal, you can use this as an opportunity to encourage animal sounds. Finally, I made a blank “face” for practicing body parts. He would take the magnets (eyes, nose, lips, hair, and ears) and place them on the blank face. This is fantastic for body awareness and identification. You could even go a step further and use a handheld mirror to show your child the same facial features. When your child needs a change in routine, you can put these activities on baking sheets from the dollar store. This makes these mini lessons easy to transport to another room or another house. Whether you are trying to introduce weather patterns or animal habitats, magnets are one tool to help find “the peculiar bent of the genius of each” child.